Drought Contingency Plans for Corps of Engineers (Nationwide) | WEST Consultants, Inc.
USACE published Drought Contingency Plans (DCPs) under Engineering Regulation 1110-2-1941 in 1981 to address increasing water demand and the potential for increased occurrences and severity of drought. This regulation provides policy and guidance for the preparation of DCPs in the context of water control management. These DCPs were directed to be prepared for each Corps project or system of projects having controlled reservoir storage. The changes that have occurred over the intervening 30 years, especially changes in demographics driving water demand, make it imperative that USACE update its DCPs to support sustainable water management. The Global Change Sustainability (GCS) Program is tasked with updating these vital DCPs to account for global and climate change. WEST coordinated with all USACE Districts to obtain their most current DCP. Depending on the nature of projects not all Districts had DCPs. WEST reviewed 120 DCPs covering 266 projects and wrote a report that summarized the findings in the DCPs including topics involving drought determination, drought actions, water law, potential surplus water availability, and drought history. The report details the water law issues governing distribution, such as riparian and prior appropriation, along with agreements concerning water usage among the states as well as water supply agreements that deal with surplus water available at the projects during a drought. The report describes the variability found throughout the DCPs along with recommendations regarding items to be considered in future DCP updates. The original DCP for Pine Flat Reservoir on the Kings River, located in the westward face of the highest portion of the Sierra Nevada Mountains in California was published in 1992 and did not account for climate variability and change. An updated DCP needed new information that had become available since 1992, including a better understanding of the hydrology of the region, recently observed hydro-meteorological data, advances in flow forecasting, and more advanced methods to identify and quantify droughts. Impacts of future climate variability induced by both natural recurring cycles and human activities were assessed. 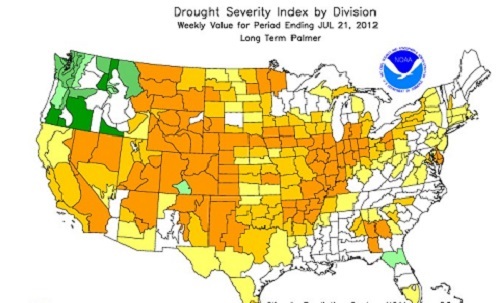 These changes are expected to significantly affect the intensity and duration of future droughts. Lower snowpack, earlier runoff, more runoff during winter months, increased temperature, increased evapotranspiration, and lower stream flows during the summer months will play key roles in drought evolution in the Kings River watershed. Drought indicators used to trigger mitigation responses at the Pine Flat Reservoir defined in a DCP were proposed to take current and forecasted watershed states into consideration in order to predict drought stressors in the system. Among the possible responses to drought are strategies that retain more water in the reservoir (i.e. encroached flood control space.) than mandated by the Water Control Manual. These strategies may represent policy deviations that require full risk assessment before approval. WEST proposed a methodology to apply global climate model (GCM) simulations in combination with a computationally efficient stochastic weather data generator. The weather data generator reproduces the appropriate statistical patterns of weather in a Monte Carlo framework for assessment of risk to Pine Flat Reservoir associated with proposed deviations from the Water Control Manual. Both unconditional and conditional risk analyses are performed based on a probabilistic hydrologic hazard method that applies Monte Carlo simulation to estimate hydrologic loads. Weather patterns can be generated based on past or future (as predicted by GCM) climate characteristics.